Mayors are in charge of running large, complex organizations but often lack the opportunity to learn from world-class experts how to develop their leadership skills and create more effective organizations. In an effort to equip city leaders with the tools and techniques needed to tackle their toughest challenges and develop a culture of continuous innovation inside city halls, Bloomberg Philanthropies is helping provide mayors and senior city hall staff with high-quality leadership development that rivals similar programs for business executives. To advance leadership, management, and innovation in cities around the world, the Initiative will make the products of all of its research, including assessment tools, videos, case studies, and instructional technology, freely available. The Bloomberg Harvard City Leadership program is part of the American Cities Initiative, a suite of investments that empower cities to generate innovation and advance policy that moves the nation forward. 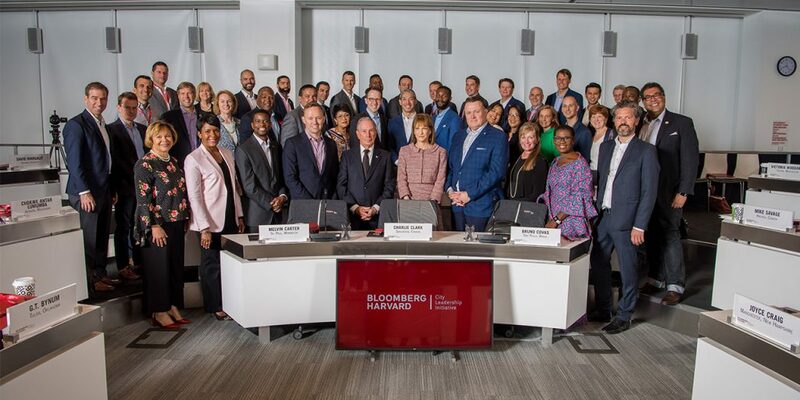 Bloomberg Philanthropies welcomeD the second class of mayors to the Bloomberg Harvard City Leadership Initiative, providing hundreds of local leaders customized executive education focused on leadership and innovation in governance. This second class of 40 mayors convened in New York City, July 22-25, 2018.